Meet "Bo" the very popular White House Puppy Pal! 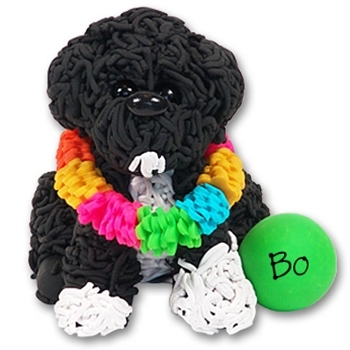 Bo comes complete with the Hawaiian lei that he was wearing when given to President Obama. He was painstakingly and lovingly crafted by hand. The lei alone is made of eighty individual hand cut pieces not to mention the individual small pieces that his fur is constructed from. We have added the little green ball so that you may personalize it with a name and a year if you so desire. He is packaged in his own little clear acrylic box with his dog house in the background. The box measures 3" W x 3" D x 3½" H.
Choose your favorite or collect them all!